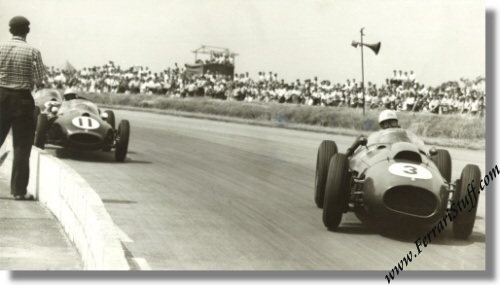 This is a vintage 1958 photo of Wolfgang Berghe von Trips in his Ferrari 246, leading Jack Brabham in his Cooper Climax during the Grand Prix of Great Britain at Silverstone. Wolfgang qualified 11th. and managed as high as 6th place in the race before he had to give up in lap 59 out of 75 with engine trouble. It measures approximately 8 x 4.5 inches. It is in mint condition and does not carry any photographer's reference.